With New Year’s Eve just around the corner, it’s time to make some serious plans. While you could spend it out with countless unfamiliar faces, why not welcome the new year in the company of your closest friends at your own party? By doing so, not only will you be able to ensure a great night for everyone in attendance, but you’ll be able to create an unforgettable experience. All you need is some great ideas and company and you will soon be kicking off the new year in style. The fastest way to take a party from dull to thrilling is by adding a theme. A theme will give you a centre point for your whole party from decorations and music to food and drinks. It’ll also give your guests an idea of what to wear and a fun chance to dress up. 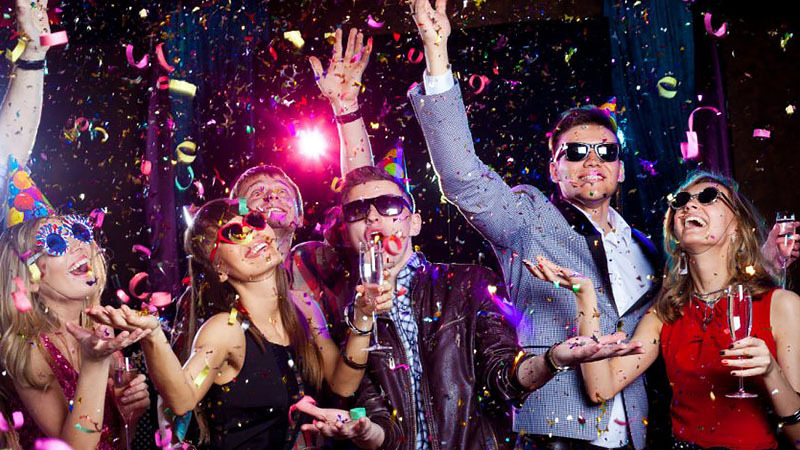 On top of that, adding a theme to your New Year’s party will help ensure a unique and memorable night. All you need to do is choose a good one and commit to decorating your home for an incredible party. Decade themes are generally a well-received party idea but they can feel a little generic at times. After all, how many times can someone keep wearing the same 20’s flapper dress without feeling bored? This year, spice things up with a retro-glam 70’s party. We’re not talking about hippy tie-dye and peace signs, but rather a disco-chic party. For costumes, think Bianca Jagger, gold maxi dresses, and plenty of shimmery eyeshadow. 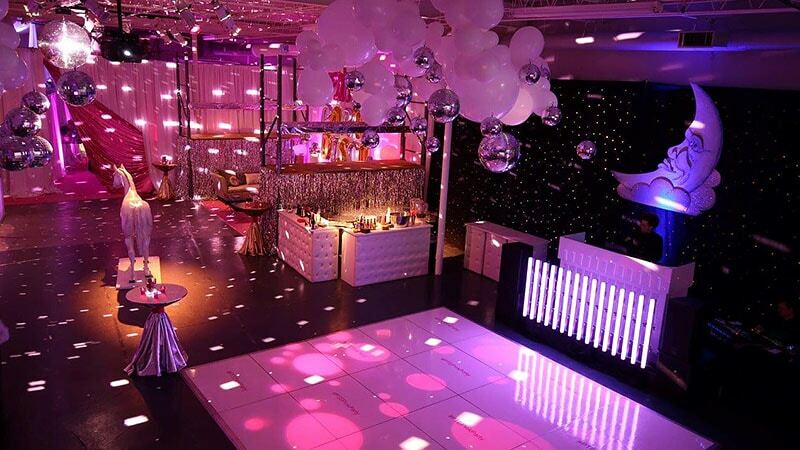 As for decorations, invest in lava lamps, confetti, velvet table cloths, and of course a disco ball. To take things a step further, add some Phillips Hue LED lights and a velvet-roped entrance for the perfect VIP party vibe. If your idea of a party looks a lot like dancing and not at all like dinner, then a neon party is the theme for you. This unique idea will create your very own club at home for your closest friends. All you need to do is switch out your regular light bulbs for black-light bulbs. 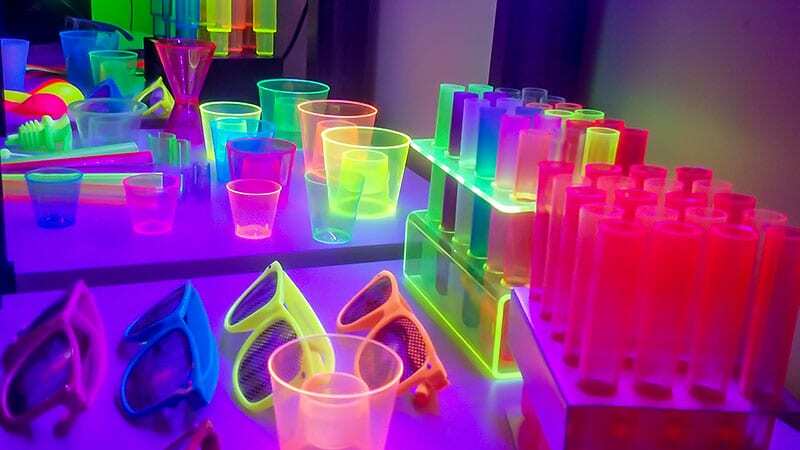 Then, instruct guests to wear light colours or white and invest in black light reactive party supplies, such as neon bracelets, glasses, cups, and straws. 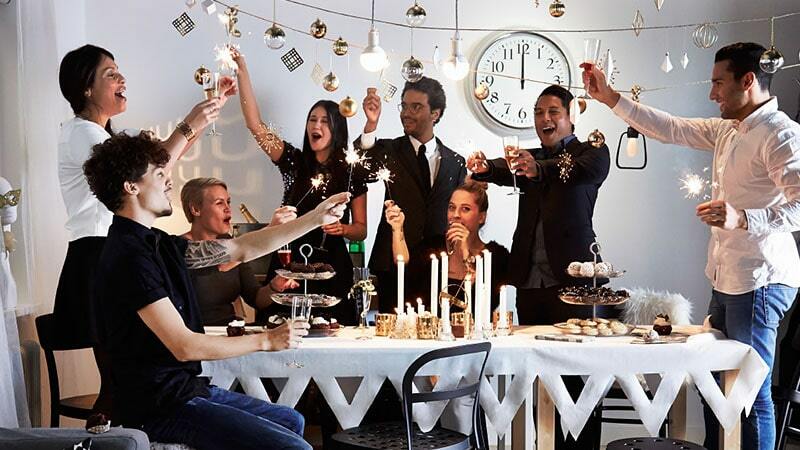 Once the party starts the room will take on a cool glow that’s perfect for dancing all the way into the new year. 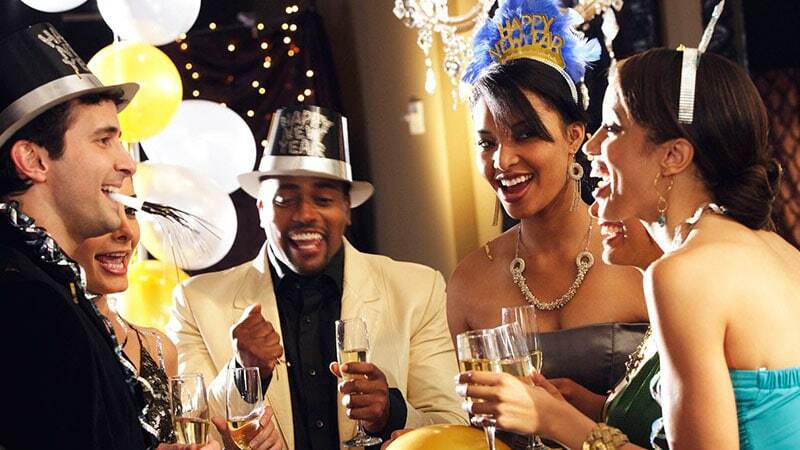 New Year’s Eve is the perfect time to dress up and go all out, even if you’re not leaving your house. By creating a Black and White Ball theme, your New Year’s party can be a stylish and classy affair that’ll give guests the best reason to buy a new outfit. Simply send invitations featuring a black and white eveningwear dress code and get to work on decorations. Deck your house in chic black, white, silver and gold pieces, such as candles, balloons, and bunting. 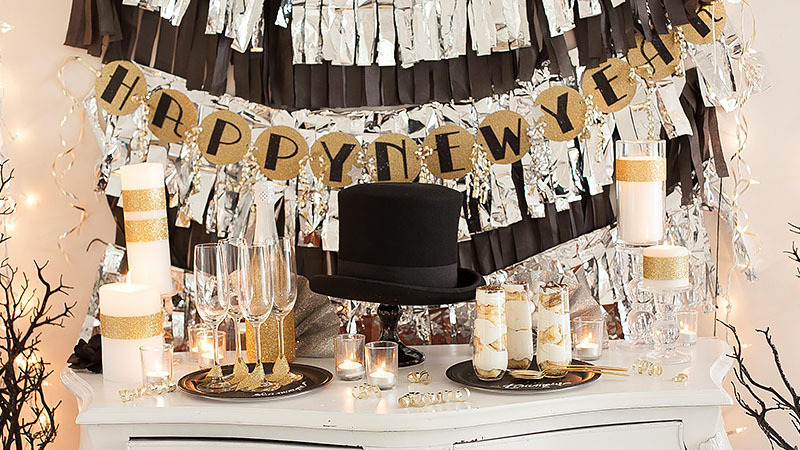 Cover champagne bottles in glitter, hang black curtains, and clear room for a dance floor. Now, add finishing touches with a red-carpet entrance and vases of white roses or feathers. When hosting a New Year’s Eve party, it’s essential to plan what food you’ll provide. After all, your guests will certainly be feeling hungry from all their dancing! Choose between a sit-down meal and canapes depending on your intended party ambiance. Also, remember to consider dietary requirements to ensure no one goes hungry. Gourmet stuffed mushrooms make a fantastic appetiser or canape and can be easily adjusted to suit different diets. Despite being very easy to make, they look fancy and will impress your guests with both their appearance and taste. On top of that, these delicious bites are easy to pick up and eat without creating messy fingers or unending dishes. When you’re hosting your closest friends on one of the most important nights of the year, it’s only natural to want to create a special meal for different tastes and dietary requirements. This superfood salad is just that. This healthy feast is sure to impress your guests without causing any dramas in the kitchen. Simple to make and delicious to eat, this dish will have everyone happy, including you. What party would be complete without a delicious dessert to cap off the night? Treat your guests this New Year’s Eve to a stylish, Champagne Glass Tiramisu. Chic, delicious and easy to eat, this unique delight promises to make the last hours of 2016 heavenly. On top of that, this decadent dessert can also be prepared ahead of time, so there’s no need for you to miss out on any valuable party time to make them. While champagne is the natural beverage choice for New Year’s Eve, it can be great to mix things up with other options. Giving your guests a greater choice and including some cocktails will make the night seem even more special and fun. Featuring only four ingredients, this champagne cocktail is super easy to make and tastes great. Sure to be a crowd-pleaser, its subtle apricot flavour gives the champagne a refreshing quality while a dash of gin gives this drink a kick. For anyone who’s not a fan of champagne, Mojito cocktail makes a great alternative. This most popular cocktail on the planet features white rum, lime, mint, sugar and soda water. This flavoursome and simple beverage is sure to get taste buds singing. Allowing your guests to help make their own drinks is a great way to give them what they want and reduce your workload. A Bellini peach mix can be prepared ahead of time and will allow party attendees to mix their own delicious drink. All they’ll need to do is pour the fruit puree into a glass, top with prosecco, stir, and enjoy. 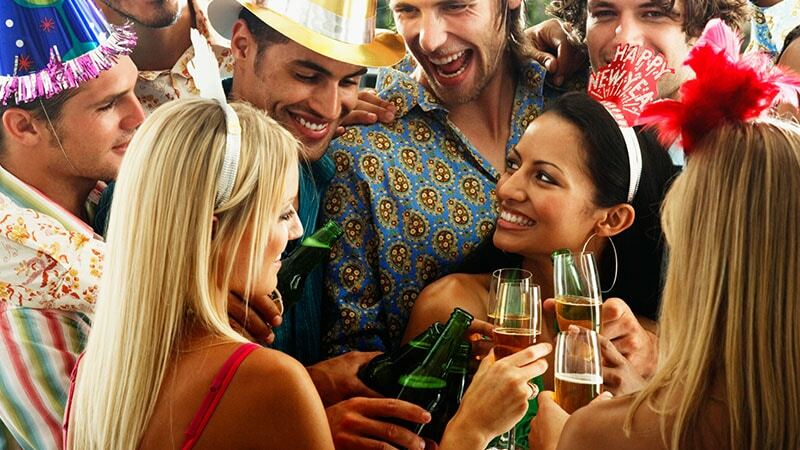 New Year’s Eve parties tend to last a while, meaning that entertainment is essential to showing guests a good time. While dancing and socialising may make up the bulk of your night, it’s great to have a few games planned to break up the evening and keep the good times rolling. The Moments of the Year Game is a great way to relive your own 2016 and see how everyone else spent it. All you need to do is prepare cards that prompt guests to describe a moment of their year, such as the hardest they laughed, their best kiss, their happiest day, etc. Then, take turns picking out of the jar and sharing your memories. Charades is always a party favourite and can easily be turned into the perfect New Year’s Eve game. By restricting your Charades topics to things from the past year, such as movies, songs, and major events, the game will turn into the ultimate homage to 2016. Part of New Year’s Eve is setting resolutions for the new year. Turn this tradition into a fun game this year with this entertaining activity. 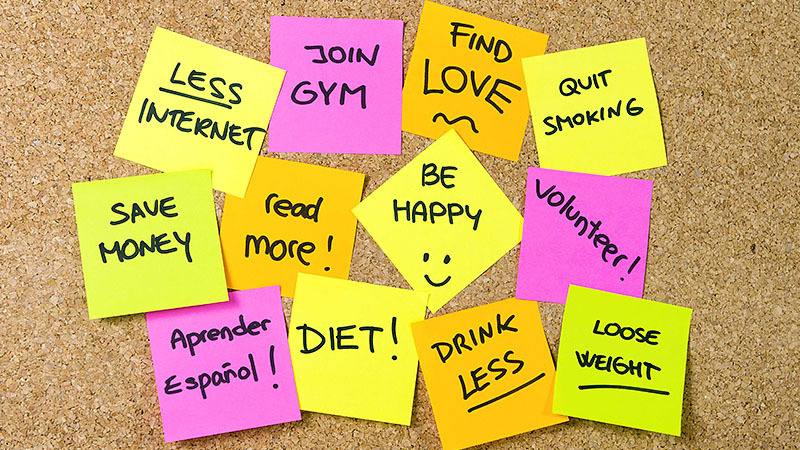 Start by giving guests cards with unfinished resolutions on them, such as “The skill I wish to learn in 2017 is…” and “The bad habit I want to quit in 2017 is…”. Once guests have filled out their cards, gather them together and read aloud at random. Then, have fun trying to guess which resolutions belong to each person.